Connected Cars…Apple takes a bite! In the world of connected cars Apple has announced their latest addition to the dashboard. 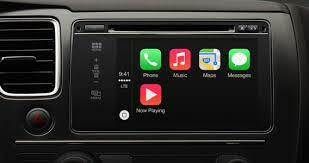 At the Geneva Auto Show, Apple reveled CarPlay, the application that will put more apps into the dashboard and connect millions of iPhone users to their cars. This is Apple’s first taste of the car industry and hopefully we will all benefit from this long overdue technology. CarPlay will not dominate the dashboard however. It will have to share space with the existing auto information platforms. Apple’s CarPlay has 11 automotive partners, including GM, Honda, and Hyundai. All of which have a framework of their own that Apple will have to integrate with. Apple will have to run in tandem with the existing software. Apple will also have to compete with the Android market, as connected cars integrate this technology also. Apple’s CarPlay Connects your iPhone to your car. So Apple’s CarPlay has a long road ahead to make it into your car! Buckle up it may be a while before you are texting from your dashboard console or googling while driving. I don’t know about you, but I can hardly wait!